when you have more time and you can check on details more easily. You will notice that every office wants to have information filled out freshly, on their preferred form, so they can enter it more accurately into their electronic record system. This extra work for you is worth it, since it will be easier for the new healthcare provider to look through your information and pick up the important details. With current doctors as well as new ones, always have your accurate current medicine list with you, or just put all your medicines in a bag and take the bag with you. Include prescriptions, over-the-counter medicines, and vitamins, supplements, herbal products, etc. Your healthcare providers can treat you more correctly and prescribe for you more safely when they know all of your current medicines. 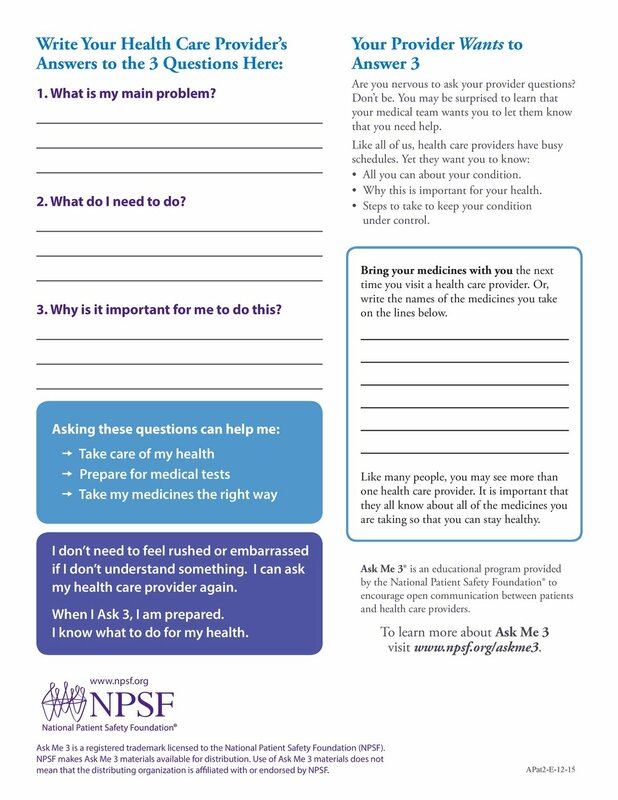 You can print the two-page form below, Ask Me 3, in color or black and white. It is a simple and useful tool provided by the National Patient Safety Foundation. help your healthcare provider make sure you understand your diagnosis and medical recommendations.